Is evening primrose oil effective after all? I still have my doubts! Evening primrose oil (EPO) is amongst the best-selling herbal remedies of all times. It is marketed in most countries as a dietary supplement. It is being promoted for eczema, rheumatoid arthritis, premenstrual syndrome, breast pain, menopause symptoms, and many other conditions. EPO seems to be a prime example for the fact that, in alternative medicine, the commercial success of a remedy is not necessarily determined by the strength of the evidence but by the intensity and cleverness of the marketing activities. Evening primrose oil has been extensively tested in clinical trials for a wide range of conditions, including eczema (atopic dermatitis), postmenopausal symptoms, asthma, psoriasis, cellulite, hyperactivity, multiple sclerosis, schizophrenia, obesity, chronic fatigue syndrome, rheumatoid arthritis, and mastalgia. As I have reported previously, these data were burdened with mischief and scientific misconduct, and it is therefore not easy to differentiate between science, pseudoscience and fraud. The results of the more reliable investigations fail to show that it is effective for any condition. A Cochrane review of 2013, for instance, concluded that supplements of evening primrose oil lack effect on eczema; improvement was similar to respective placebos used in trials. But now, a new study has emerged that casts doubt on this conclusion. The aim of this double-blinded, placebo-controlled RCT is to evaluate the efficacy and safety of EPO in Korean patients with atopic dermatitis (AD). Fifty mild AD patients with an Eczema Area Severity Index (EASI) score of 10 or less were randomly divided into two groups. The first group received an oval unmarked capsule containing 450 mg of EPO (40 mg of GLA) per capsule, while placebo capsules identical in appearance and containing 450 mg of soybean oil were given to the other group. Treatment continued for a period of 4 months. EASI scores, transepidermal water loss (TEWL), and skin hydration were evaluated in all the AD patients at the baseline, and in months 1, 2, 3, and 4 of the study. 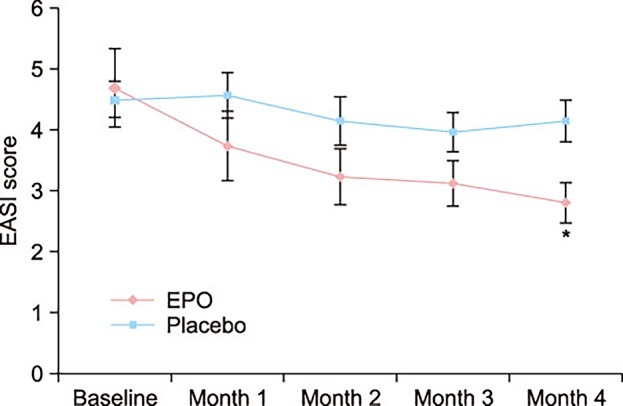 At the end of month 4, the patients of the EPO group showed a significant improvement in the EASI score, whereas the patients of the placebo group did not. There was a significant difference in the EASI score between the EPO and placebo groups. Although not statistically significant, the TEWL and skin hydration also slightly improved in the EPO patients group. Adverse effect were not found in neither the experimental group nor the control group during the study period. The authors concluded by suggesting that EPO is a safe and effective medicine for Korean patients with mild AD. One cannot possibly draw conclusions based on such a small sample. The authors state that a total of 69 mild AD patients were enrolled and randomized into either the control group (14 males and 17 females) or the EPO group (20 males and 18 females). Six patients in the control group and 13 patients in the EPO group dropped out due to follow up loss. No patient dropped out because the disease worsened. Should this not have necessitated an intention-to-treat analysis? And, if 19 patients were lost to follow-up, how do the authors know that their disease did not worsen? The graph shows impressively the lack of a placebo-response. I don’t understand why there was none. The authors state that there were no adverse effects at all. I find this implausible; we know that even taking placebos will prompt patients to report adverse effects. So, what to make out of this? I am not at all sure, but one thing is certain: this study does not alter my verdict on EPO; as far as I am concerned, the effectiveness of EPO for AD is unproven. 3 Responses to Is evening primrose oil effective after all? I still have my doubts! I missed the lack of placebo effect. Couldn’t subjects just break open the capsules and taste the oil? I know they promise not to, but I also think I’d have a hard time not doing it. Whenever I see a study like this I assume at least some the subjects broke the capsules. I did some looking around and Evening Primrose mostly tastes like carrier oil, or rancid carrier oil. Nobody says it tastes like flowers. It sounds like they used the pure stuff, so the meaning is unclear. But if the subjects broke blinding, then you’d expect there to be no placebo effects, or at least none reported. Why didn’t they try it on people with serious disease? It looks like no one was worse than a five. If the effects were not statistically significant, why not be clear about that in the comments? Why tout something as a success when it really is not? What is supposed to be better about EPO than soy? Did the authors speculate on this? How objective is the EASI score?